From time to time, a user may notice that multiple Customer records exist in Acctivate and QuickBooks that should be a single Customer record. This help article will show how to merge two Customer records and their transaction history together into a single record. In the screenshot below, notice the two open Customer windows. One showing the Customer “Smith” the other showing “Smith Photography.” In this example, we are assuming that both of these Customer records should represent a single Customer in Acctivate and QuickBooks. The first step in resolving this is to determine which Customer Name is correct and should continue to be used, and which should not. In the example, let’s assume that Smith Photography should be used, and Smith should not. In order to merge Customers in QuickBooks, you must first log into the QuickBooks file in Single User Mode. Once in Single User Mode, open the Customer record which should continue to be used and copy the Customer Name to your clipboard (CTRL + C). With the correct Customer Name saved on your clipboard, close that Customer window and open up the Customer that is using the incorrect Customer Name. Paste the correct Customer Name into the Customer Name field to replace the incorrect name, then click OK. QuickBooks will populate a warning that indicates that the Customer Name already exists and that the records will be merged. 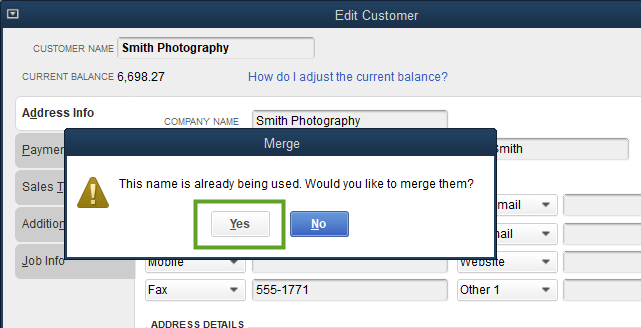 Assuming this is correct, click Yes to merge the two Customer Records in QuickBooks. Once the Customer records are merged in QuickBooks, while still logged into the QuickBooks file in Single User Mode, run a sync in Acctivate. The sync should merge the two Customer records and transactions to match QuickBooks. If the duplicate Customer record is re-created in QuickBooks after the sync, follow the steps in this help article. *It’s important to note, if either of the two Customer records have existing transactions that are older than the defined Closing Date in QuickBooks, a Password must be entered to merge the Customers in QuickBooks. Further, in order for the changes to take effect in Acctivate, the Closing Date should be removed or set to the day before the oldest transaction for either Customer record before syncing. Once the Customers are merged in Acctivate, set the Closing Date back and sync again to re-set the Closing Date in Acctivate. If you continue to have issues, contact Acctivate Support here.